In the previous article, John Conway lead us through the early days of quantum physics and explained why the non-predictive nature of this theory worried some physicists, in particular, Albert Einstein. Einstein believed that physical properties, such as the position and momentum of quantum particles, have definite, fixed values whether those properties have been measured or not. In 1935 Einstein, along with colleagues Podolsky and Rosen, came up with the EPR Paradox, an ingenious thought experiment that seemed to show that quantum physics contradicted special relativity. In this article we'll jump forward 30 years, and explore a development that not only seemed to explain the EPR Paradox, it also provided the first hint of Conway and Kochen's Free Will Theorem. You can think of quantum particles as if they are spinning around on an axis, and their spin as the angular momentum of the particle. (The particles aren't actually spinning, spin is an inherent property of the particle, but it can be helpful to picture it this way.) If the particle is spinning clockwise around a vertical axis, its quantum spin points down, and if it spins the other way the spin points up. As well as a direction (up or down its spin axis) the spin also has a value. But being quantum it’s all quantised – the spin can only take one of a small number of particular values. For example, for spin 1 particles the spin can only take the values of 1, −1 or 0. If you’re measuring the spin of a spin 1 particle in a particular direction then this will either be 1 (the particle is spinning anti-clockwise around an axis in this direction, with spin pointing up this axis ), −1 (the particle is spinning clockwise and the spin is pointing down this axis), or 0 (the particle is not spinning around this axis). Quantum mechanics predicts that a spin 1 particle will have any one of these values with equal probability (ie, the spin value will be 1 roughly a third of the time, 0 a third of the time and −1 a third of the time). As spin 1 particles have spin of either 1, −1 or 0, then something called their squared component of spin in any direction can only be 1 (=12 =(-1)2) or 0 (=02). The spin in that direction is 1, −1, or 0 with probability 1/3 for each of these values. “After you’ve squared it it’s 2/3 probability of [the squared spin] being 1, and 1/3 probability of [the squared spin] being 0, because −1 and 1 have been lumped together,” says Conway. You don’t have to believe quantum mechanics to believe this axiom is true; the 101 property can be experimentally verified. You could go to a lab yourself and do the measurements zillions of times until you are satisfied. “It might be 011, or 110. But if you measure the squared spin of a spin 1 particle from three perpendicular directions you always get two 1s and a 0,” says Conway. Conway and Kochen took this SPIN axiom as the first axiom in their Free Will Theorem. Kochen and Specker proposed a thought experiment where they assumed that Einstein's instinct was right: a spin 1 particle has definite, fixed values for its squared spin in every direction. 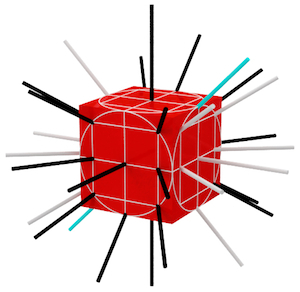 Suppose the particle’s squared spin is 0 in a particular direction, say the direction from the particle to the centre of one of the faces of the box (say, to the single dot of the 1-face of the die). If the squared spin in this direction is 0, then you known it is also 0 in the other direction (see the explanation in the full proof). 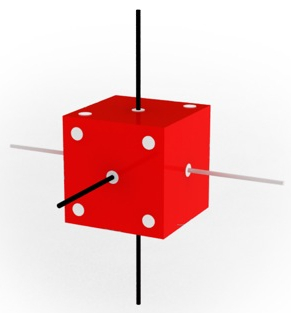 So you can stick a white knitting needle through the centre of this face of the box (the single dot on the 1-face), through your particle and out the opposite side (the centre of the 6-face), to indicate the squared spin is 0 in both these directions. As the squared spin of the particle is 0 in this direction then, by the 101 property, you know that it must be 1 for every direction perpendicular to your white knitting needle. So the squared spin must be 1 in the direction from the particle to the centre dot of the 5-face. You stick a black knitting needle through the centre dot of the 5-face, through the particle, and out the opposite side (the centre of the 2-face) indicating that it is 1 in these directions. In the same way the squared spin must also be 1 for the direction from the particle to the centre dot of the 3-face, and you insert a black knitting needle through this dot, through the particle and out the middle of the 4-face. The simplese proof of the Kochen-Specker Theorem considers just 33 directions. If you assume that the squared spin of the particle has a definite value in each of these directions, you end up with a contradiction: the squared spin in one direction ends up being both 0 and 1 (indicated by the blue needle). “This reminds me of when I was a little boy and I played Twenty Questions with my two sisters,” says Conway. Many of us have played this game. You decide on an object and say whether you’re thinking of an animal, vegetable or mineral. Then the other players ask you questions that have only two possible answers: yes or no. “But I used to do the following. If I sensed somehow that my two sisters were getting too close to my object I would choose a new object! But you have to be quite clever to do that because you have given answers that applied to your old object. (By the way, the penalty of being caught out was to have your earlobes bitten! My god it hurts like hell! I can still remember it 65 years later!) You have to find a new object that gave those various answers too. Conway says that he now recognises the first hints of his Free Will Theorem in Kochen and Specker’s 1967 result: “This proves something which in itself is a first approximation to the Free Will Theorem,” says Conway. The value that you are trying to measure, in this case the squared spin of a particle in a particular direction, can’t exist before you conduct the experiment. Instead the behaviour of the particle, as measured by the value of its squared spin in a particular direction, is decided “on the fly”. But Conway said he and Kochen were not actually thinking about free will at all when they were working together. “We didn’t know we were going to say anything about free will. We were just trying to understand this Kochen Specker thing and its interaction with the EPR Paradox.” But as we shall see in the next article, they stumbled upon a result that could have deep philosophical consequences for quantum mechanics, and our world view in general.